Battle for the Elephants premiered February 2013. National Geographic uncovers the criminal network behind ivory’s supply and demand. The film tells the ultimate wildlife story — how the Earth’s most charismatic and majestic land animal today faces market forces driving the value of its tusks to levels once reserved for precious metals. Journalists Bryan Christy and Aidan Hartley take viewers undercover as they investigate the criminal network behind ivory’s supply and demand. In Dar es Salaam, Tanzania, one of the world’s main ports for smuggled ivory, Hartley attempts to buy large quantities of tusks from poachers. In China, Christy explores the thriving industry of luxury goods made from ivory and the ancient cultural tradition of ivory carving. 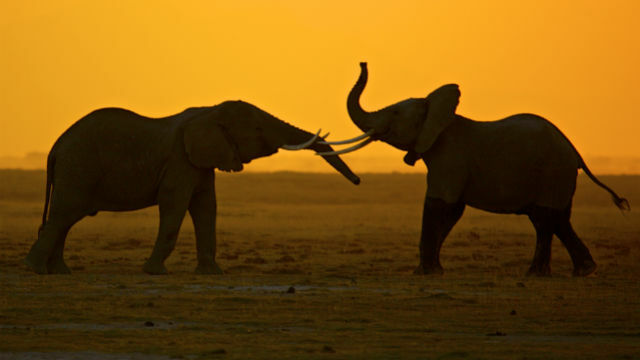 Two young elephants greet each other at dusk in Amboseli National Park, Kenya. Photo courtesy of J.J. Kelley. Since the opening up of the Chinese market and the growth of its economy, ivory, once a precious material available only to the ruling elite, has become increasingly available to the growing Chinese middle class. The film traces the ivory trade and its impact on Africa’s elephant population over the course of the past two centuries. In 1800, an estimated 20 million elephants lived in Africa. With the rise of industrialization and the mass production of items made from ivory, such as combs, billiard balls and piano keys, the elephant population was cut in half. By 1913, as the United States consumed more than 200 tons of ivory a year, only 10 million elephants remained. Post-war ivory consumption continued, and by 1989 the elephant population was reduced to 600,000. A worldwide ban on ivory sales in 1989 led to a rebound in the population, to about 1 million. But in 1999 and 2008, due to pressure from countries in Asia and southern Africa, the Convention on International Trade in Endangered Species (CITES) allowed two sanctioned sales of ivory. According to Christy, these two sales gave cover to ivory smugglers in China, and the underground market exploded. According to CITES, 25,000 elephants were killed in Africa last year, though other observers say it could be many more. In Tanzania alone, poachers kill 30 elephants a day. The International Fund for Animal Welfare estimates that 84 percent of the ivory sold in China is illegal. Battle for the Elephants features those in Africa on the frontlines studying elephant behavior and leading the deadly fight to protect the animals from armed poachers. At the Amboseli Trust for Elephants in Kenya, Deputy Director Soila Sayialel explains how the elephants’ highly evolved society, keen intelligence and ability to communicate across vast distances and to love, remember and even to mourn, are far more complex than ever imagined. She also describes how the rise of poaching has caused disturbing changes in elephant behavior, including increased agitation, stress and aggression in the presence of humans. Hartley meets with Khamis Kagasheki, minister of natural resources in Tanzania, which stores the world’s largest stockpile of elephant tusks in the world — 90 metric tons. Kagasheki agrees to allow Hartley and the camera crew to take the first-ever footage of the vast warehouse that stores thousands of tusks, valued at $50 million. Unlike Kenya, Tanzania, one of the poorest countries in the world, has not agreed to burn its stockpile, arguing that the money from a sale could support conservation efforts. An official says that if an international agency were to buy the tusks with the intention of burning them, they would eagerly sell them. Battle for the Elephants is a production of National Geographic Television.